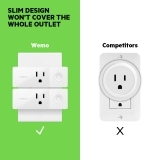 Wemo Mini Smart Plug Bundle 3-Pack is rated 3.8 out of 5 by 86. 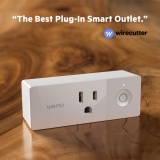 The Wemo Mini Smart Plug lets you control your electronic devices right from your phone or tablet. 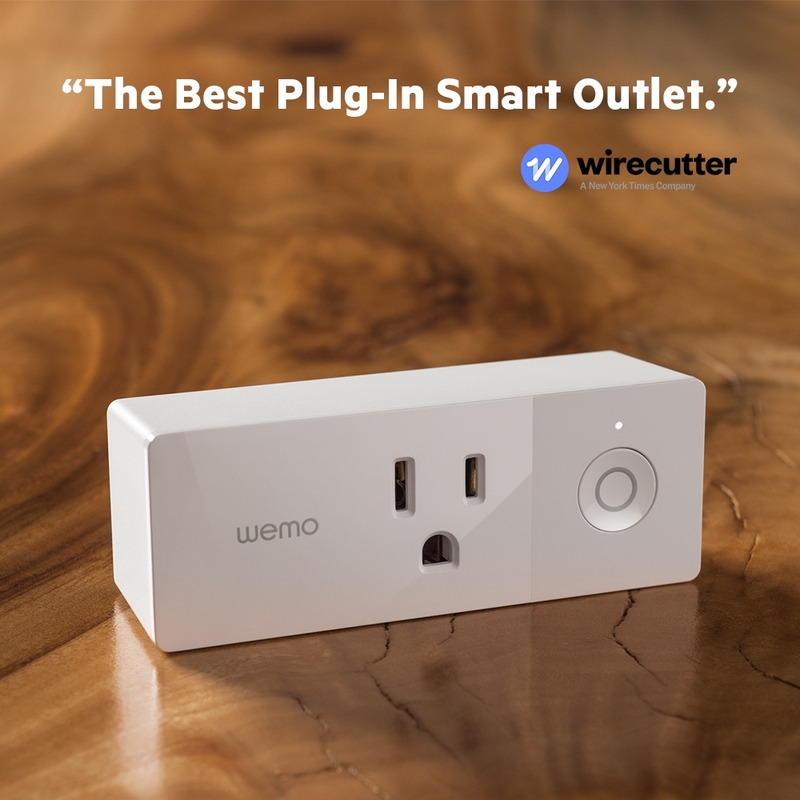 The Smart Plug uses your existing home WiFi network to provide wireless control of lamps, heaters, fans, and more -- with no subscription or hub required. 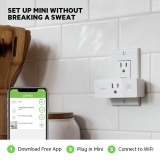 Simply plug the Wemo Mini Smart Plug into an electrical outlet, plug a device into the Smart Plug, and control your device using the free Wemo app. Whether you’re unwinding on the couch or vacationing in the Caribbean, you’ll be able to remotely control your lights and appliances from anywhere in the world. 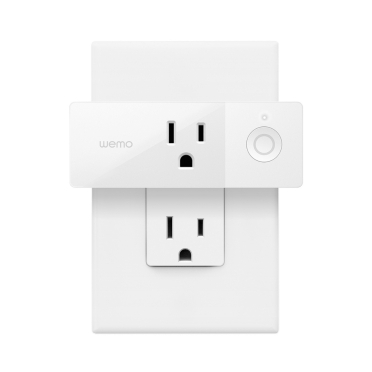 With its sleek, compact form factor, Wemo Mini fits into any electrical outlet without obstructing other sockets. 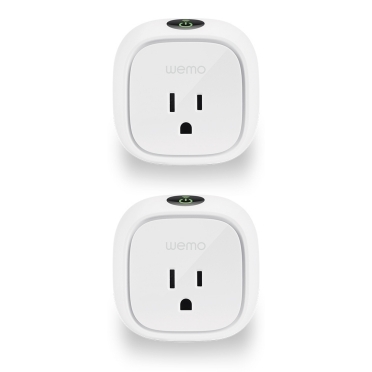 This allows you to stack an additional Wemo Mini or plug in another device in the same outlet. 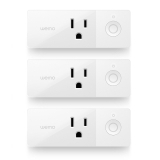 Wemo Mini lets you easily set automatic schedules for any device that’s plugged in--from lamps to fans to space heaters. 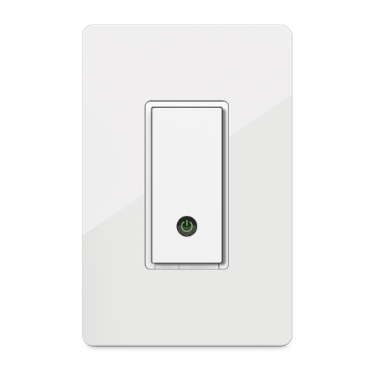 Using the free Wemo app, you can schedule a fan to turn on at noon, or synchronize a lamp with the sunset so you never come home to a dark house. 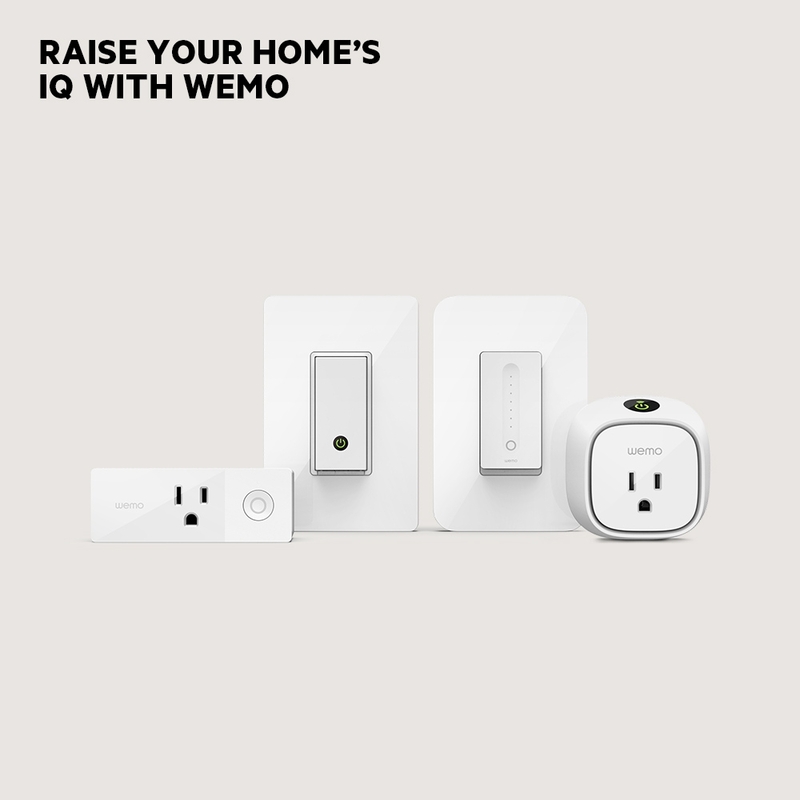 With the ability to randomize your lights, Wemo Mini protects your home better than a mechanical timer. When set to “Away Mode,” the smart plug will turn plugged-in lights on and off randomly to make it appear like you’re home--even when you’re not. 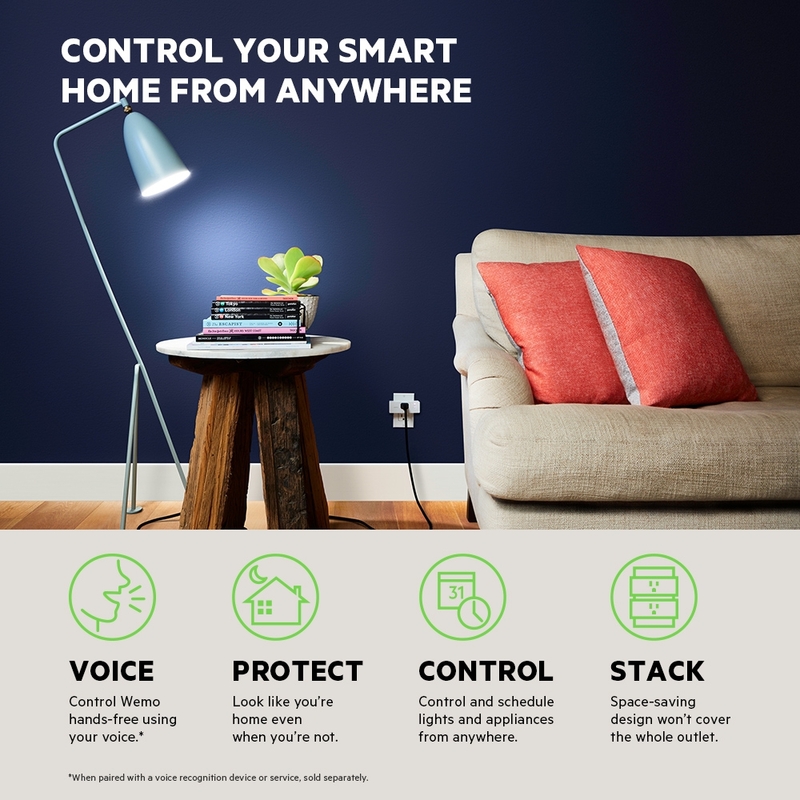 Wemo works seamlessly with Alexa to give you hands-free voice control over your lights and devices. 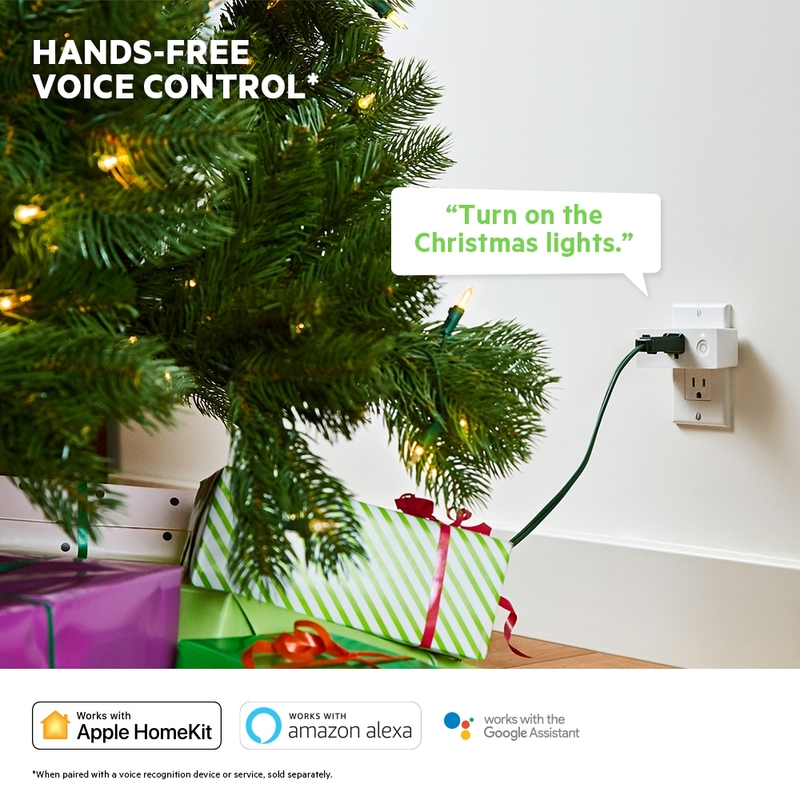 Enable the Wemo skill and pair Wemo Mini with Alexa to turn any plugged-in device on or off with just the power of your voice. 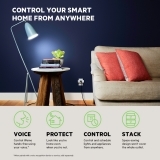 Wemo works with the Google Assistant, allowing you to control your lights using your Google Home devices, your Android or iPhone, or any other device with built-in Google Assistant support. 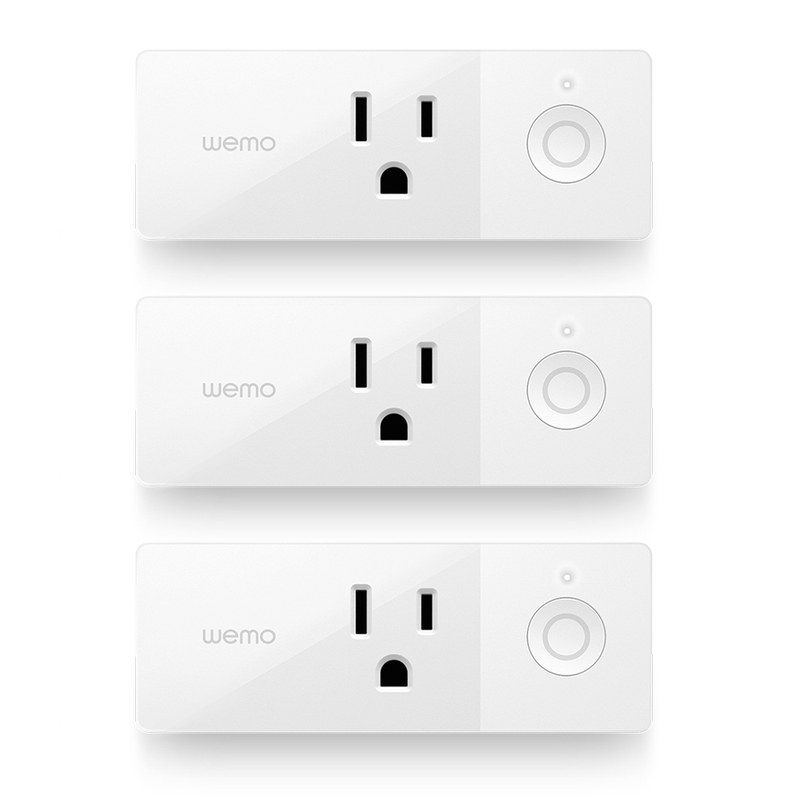 You’ll enjoy seamless, intuitive voice control over any device that’s connected to Wemo Mini. 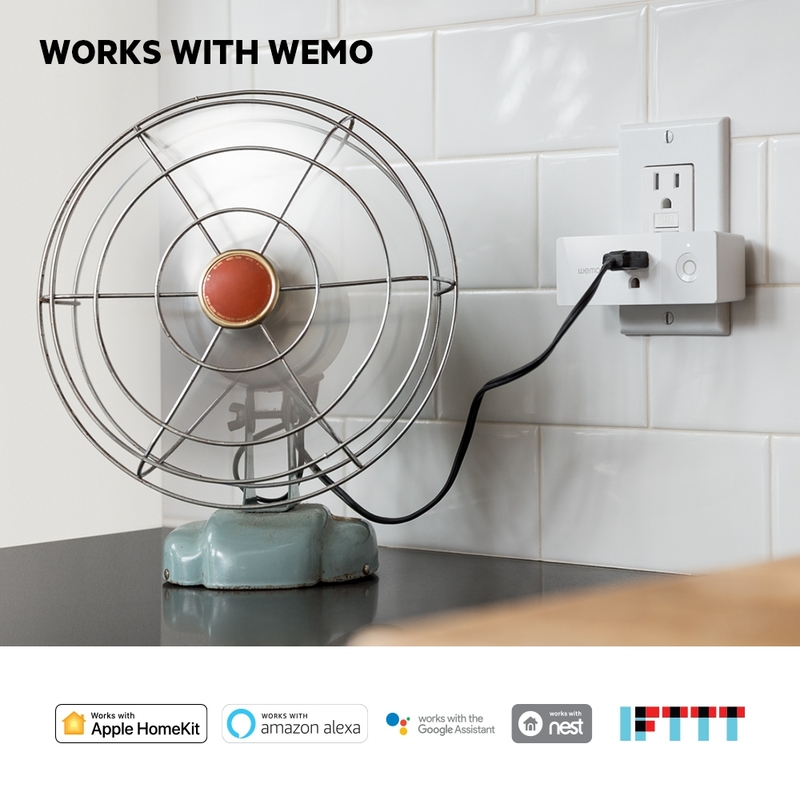 Wemo is compatible with Apple HomeKit, meaning you can control your Wemo Mini with the Apple Home app and Siri from your iPhone, iPad, Apple Watch, or HomePod. Now you can ask Siri to turn on the lights and brew your coffee when you wake up. When paired with Nest's Thermostat, Nest's "home" and "away" modes can sync with your Wemo Mini for automatic control. Nest can tell Wemo when you're home or away, so your fan can turn off to save energy when the house is empty. Or your lights can turn on automatically when you walk in the door. 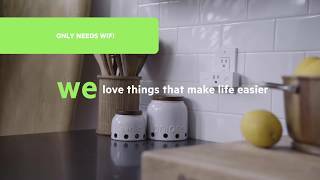 "If This, Then That" is a free web-based service that opens up an amazing array of possibilities for your Wemo Mini. 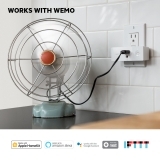 Visit IFTTT.com to find "recipes" for making Wemo Mini turn lights on and off based on real-world events, send you push notifications about device activity, and much more. When a light or appliance is plugged into a Wemo Mini Smart Plug, you can turn it off from your phone no matter where you are. 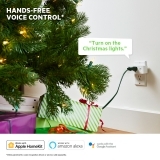 You’ll never have to worry that you accidentally left the iron or Christmas lights on again. Designed for residential indoor dry location use only. Additional Information Electrical Rating: 120V~/15A/60Hz/1800W; Indoor Use: Designed for residential indoor dry location use only. 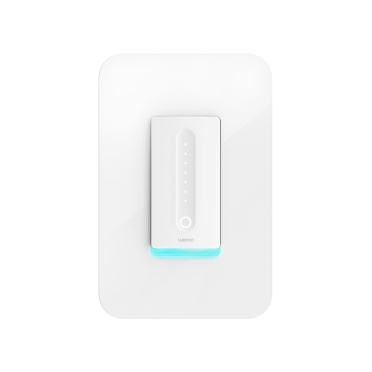 Rated 1 out of 5 by OH Jeff from Big Fail: Product won't connect to Network I use this product successfully at a second home. Tried to set up in my primary home, with all up to date network equipment. Can't finalize the setup. Tried on 3 different devices (2 iPhones and an iPad), also tried to pair with the Home app on iOS, still no success. Shouldn't be that difficult to get these up and running. Switching to another brand. Rated 2 out of 5 by Bepr0409 from One BIG flaw :-( Trying to use devices in 2 locations. Unbelievable that you can’t. You also can’t forget a location once you have it on a device, phone, tablet. The only way to control a second location is with a new phone or tablet. I’ve spent hours with different technical support to learn this. I love the devices I don’t like the run around I received to reach this conclusion. Rated 4 out of 5 by Jdbos from New design easier to set up This pack has a scannable icon that makes them easier to configure. CAUTION. You need a separate iPhone for every home in which you use them so I couldn’t add beach home Wemos to the phone running my home. 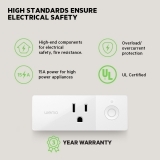 Rated 3 out of 5 by LETitbe from Product needs to be improved I was given one wall outlet as a gift and recently purchased a "3-Unit Package" which was on sale. Setting them up was not an easy task. Quite complicated. THEN "Firmware" updates. THEN the wall plug became confused by my dual channel router. I have reset ALL of the units several times. This product needs to be technologically improved. Rated 5 out of 5 by KarenN from Love them! The items came promptly, were in great shape. They were very easy to install. The instructions were clear, the app was easy to download and use. We couldn't be happier. I'd definately buy more. Rated 1 out of 5 by JohnW from Terrible Setup Setup from iPhone is poor. HomeKit only sees one of three outlets I set up. Setup from the WEMO app took several hours/attempts. 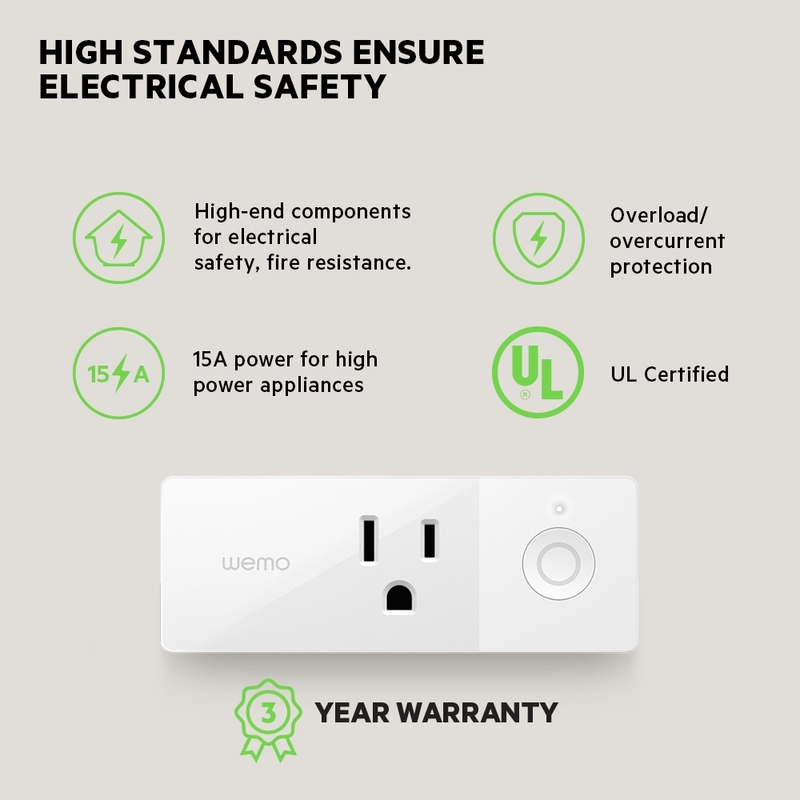 Several phone restarts and delete/re-install of WEMO app. Once setup, the devices constantly go undetected in the WEMO app. Horrible setup isn’t the worth the headache. Rated 3 out of 5 by slothinker from Great features and works great once it gets going I bought this set with the hope of having the switches show up in Apple Home. Unfortunately even with the Home scan code on the smart plug, it's hit and miss, mostly miss. I fell back on setting this up for Alexa, which is not a problem but it is surprising to me that this cannot work better with Apple Home. 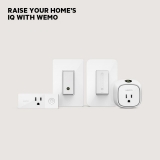 Even setting up for Wemo is a bit tedious although that is a process I can handle. Rated 1 out of 5 by Kiel from Fail They worked with google assistant at first, now they don’t. 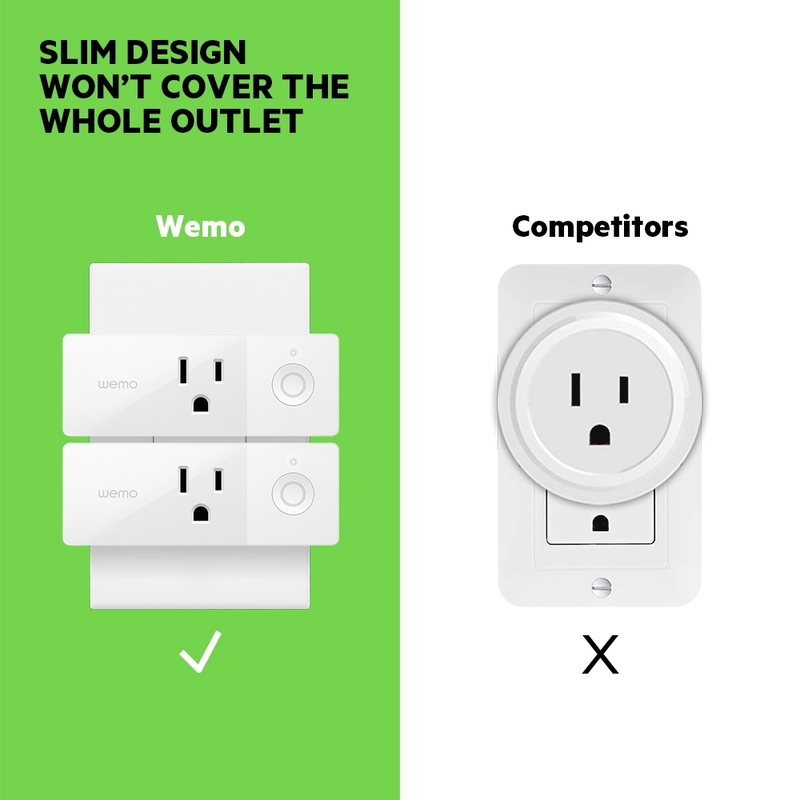 “Wemo can’t be found”.